Another week gone, another Sunday, and here I am sitting down to write about more drawing practice. Today I worked through the next section of Drawing on the Right Side of the Brain. The first pages of this chapter greeted me with a list of supplies I'll apparently be needing at various points in the course. I have paper and pencils already, as well as a "marking pen" (a Sharpie) lying in my desk drawer. Pencil sharpener? Check. Erasers? Check! Graphite stick, masking tape, clips, drawing board, picture plane, viewfinders, mirror? Uhhh... I'll get to those when I need them. Last session was all reading and rationale; this time, I actually got to pick up a pencil. The first exercises were three "pre-instruction" drawings, serving as a sort of warmup and as a record to look back on when my skills have hopefully advanced. 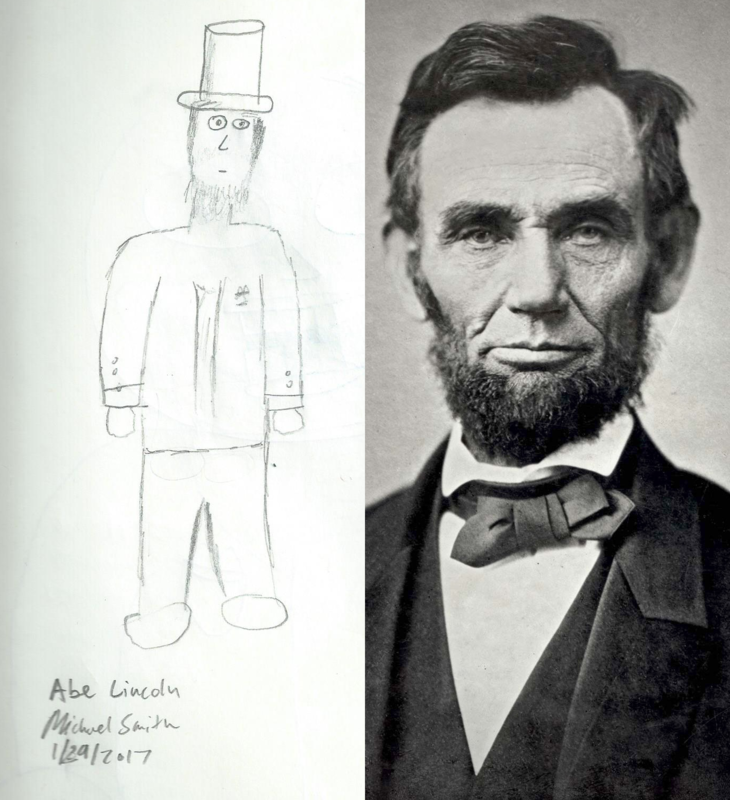 Half-way through sketching Mr. Lincoln, I realized I had no idea what to do about his suit, or clothes in general. At least I got the iconic beard and top hat in. Assignment two: facing a mirror, prop the drawing board clipboard up between the wall and my lap and attempt a self-potrait. 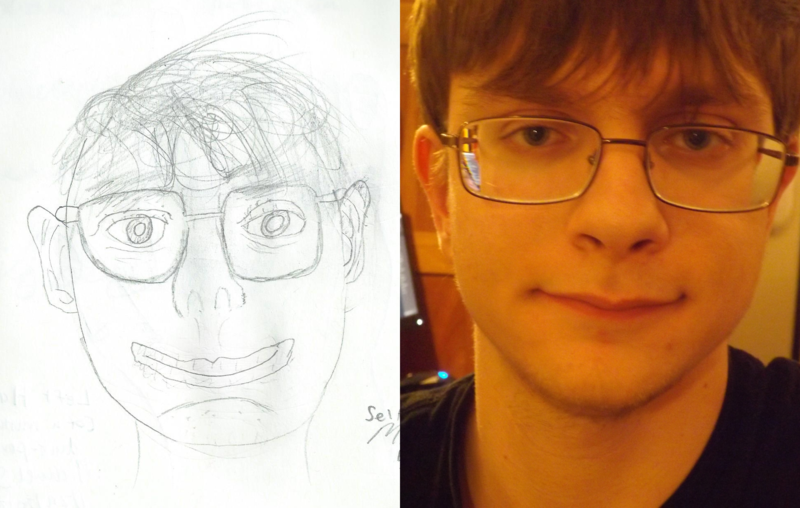 A perfect likeness, no? Well, at least this is the "pre-instruction" stage. I've read that hands and eyes are really hard to get right, but no one warned me how difficult mouths would be. When you really look at them, lips are these weird, squiggly, lumpy shapes that are hard to draw as you see them. After several attempts I was very tempted to just put a line through the middle of an oval and call it a day. I had a lot of trouble with the chin as well, trying to get it to "pop out" three dimensionally from the rest of the face. Another learning: it's tough to do shading without making it look like facial hair, especially if you want to include that little dip between the nose and mouth without it resembling a certain infamous toothbrush mustache. Of the three tasks, I'm surprised to say this is the one of which I'm the most proud, or at least the least embarrassed. Drawing in the thumb after the rest of the hand was particularly instructive. My initial instinct was to do another flat curve facing straight toward the viewer, as if my thumb weren't opposed to the rest of my hand. It took some slowing down and inspection to make it properly point sideways. I think it turned out better than the other fingers as a result. After these exercises, the author touches on a few more points before the end of the chapter, including the idea of personal style in drawing. She writes that it shows through even in "realistic" drawing, where one is trying to hew closely to the world as it really appears. This is because style is more a reflection of how one perceives the world than idiosyncrasies in mechanical motions of the hand. She also compares it to a signature, presenting a set of sample signatures of the same name and encouraging the reader to make inferences about the different sorts of people who would produce each one. Until next time! Which will hopefully come sooner than the last one. Drawing is a skill I've wanted to develop ever since I was a kid sketching out imaginary video games in the backs of school notebooks. 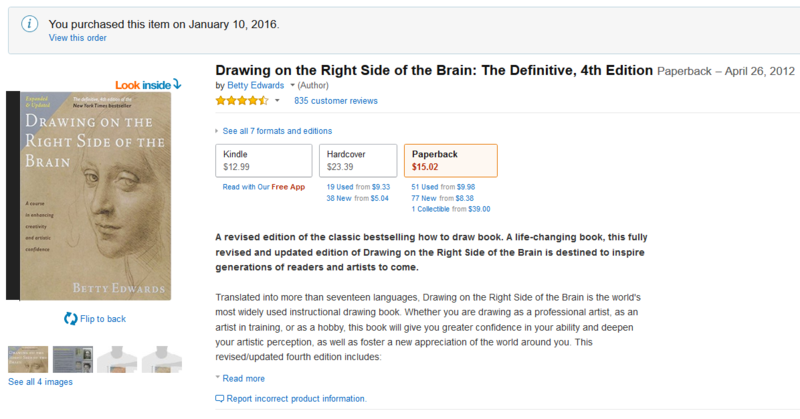 I never really "got around" to putting time and effort into formally studying it, until last year, when—according to Amazon—I purchased a copy of Drawing on the Right Side of the Brain by Betty Edwards, along with a big green sketch notebook and a set of art pencils. At the time I resolved to make time in my schedule for regular drawing practice, an hour or so a day, a couple of days a week. Reading stories from others around the web who taught themselves to draw, the most common advice I've seen is to just keep sinking time into it on a regular basis until your brain crosses some threshold of practice and starts to get better at the task. If I'd spent that year plugging away at this, maybe I'd have reached that point by now; unfortunately, apart from one or two initial sessions, my new supplies just sat on a shelf collecting dust. I still want to learn to draw, though, so when 2016 became 2017 I told myself that I'd start that weekly regimen over again, Monday-Wednesday-Friday, and this time I'd commit to it. Of course it's now nearly the end of January and today is a Sunday, but "better late than never", or something. I spent today's session working my way through the first two chapters of Drawing on the Right Side of the Brain, which form an introduction to the background, approach, and teaching methods of the book—so the pad and pencils sat untouched for this first hour. 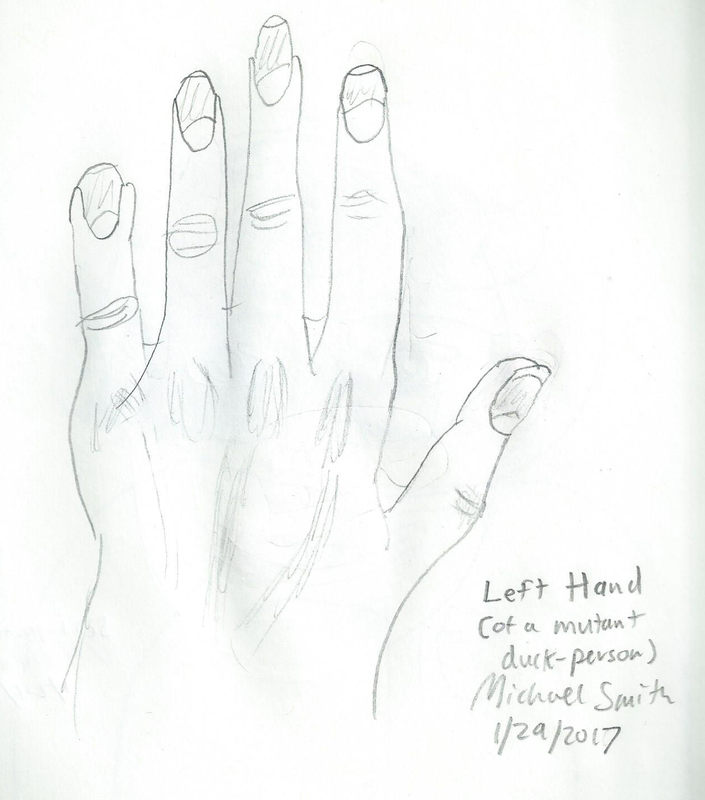 The author makes the case for learning the basics of drawing as a matter of building up perceptual skills, and that these skills can transfer to problem solving and reasoning in other areas beside art for art's sake. One page includes a series of sketches of mechanical designs, process diagrams, and so on excerpted from the notebooks of well-known scientists and engineers: this reminded me of how I'd struggled to come up with similar visualizations when trying to communicate design ideas to my high school robotics club, and how useful some basic sketching skills would have been. Edwards emphasizes an instructional approach geared toward turning down the verbal, rational, explicit "left side" of the brain and shifting the task of drawing to the "right side", which handles visual perception and more intuitive, not-completely-conscious skills like riding a bike. I'm uncertain of the scientific basis for allocating these functions along an exact left/right division, but the notion works as a metaphor either way. She also downplays the idea of an innate, fixed level of talent and states, repeatedly, that her book is targeted toward "absolute beginners" with "low-level drawing skills and with high anxiety about their potential drawing ability"—which I find reassuring, because that's a pretty good description of me approaching this work. 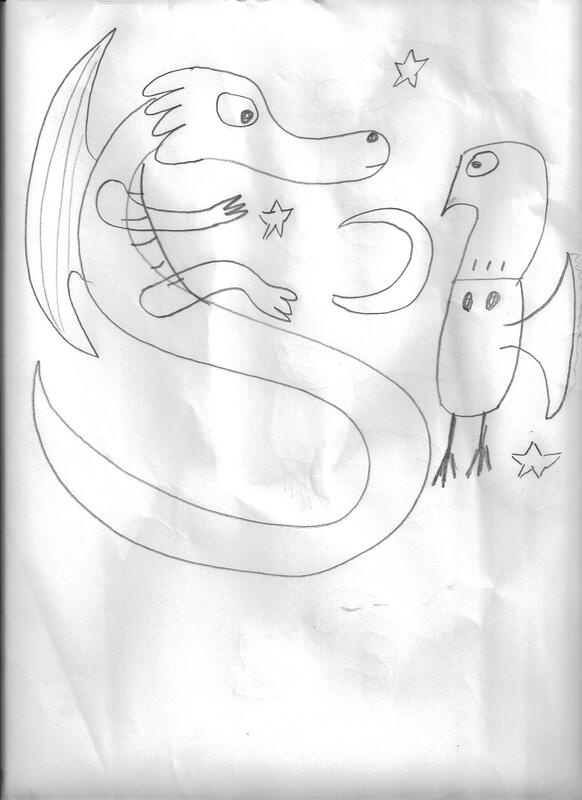 Monday's session should involve some actual drawing exercises, but for now, here's a quick "before" doodle of a dragon and an owl.